Healing Services with the laying on of hands are held regularly; please see the noticeboards for details. 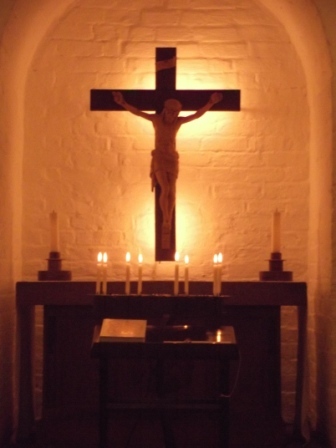 The figure on the cross in the Crypt Chapel was carved by Denis Alva Parsons. Much of this traditionally-schooled craftsman’s work can be found in the great buildings across the UK and beyond, including St Paul’s Cathedral, Westminster Abbey and the House of Parliament. Denis was in demand as a teacher and lecturer and demonstrated at the Royal Academy and also for the Royal Fine Art Commission in the presence of Her Majesty the Queen. In 1993 he was awarded the MBE in recognition of his services to conservation.